Toyota Ireland has just launched its updated new Corolla, with prices starting from €21,995. The world’s best-selling car has more prestige and elegance than ever. Since the Corolla’s launch more than 50 years ago, 44 million have been sold worldwide. With added attention to detail, the Corolla’s legendary quality, durability and reliability is as exceptional as ever. The 2017 Corolla improves on the winning formula, by adding enhancements in key areas of design, interiors, technologies, safety and handling. Toyota says in a segment where style is key, the new Corolla has had some amendments to its design for maximum efficiently and a seamless look. 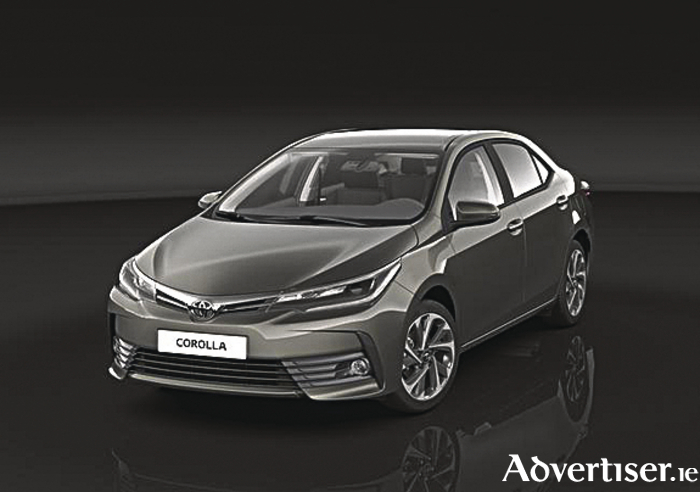 At the front, the Corolla has restyled features including the new ‘Keen Look’ and ‘Under Priority’ design concepts, enhancing the front of the vehicle. Keen Look and Under Priority was first introduced in the 2012 by the Toyota Auris. Emphasising the bumper openings at the front of the car, as seen in the lower grille aperture and the fog light recesses. For a sportier feel, it employs sharper character lines. At the side, new 16” and 17” alloys highlight the flowing silhouette of the car, while the new chrome door handles enhance the prestigious look of the character line, integrating into the door for a more streamlined look. Toyota says significant changes have been made to the interior to create a new modern, flowing, premium look and feel with no sharp edges. With hints of soft padding, leather trim and highlights of chrome ornamentation creating a stylish, sleek look throughout the cabin, the interior looks and feels less fussy and appears more as one. The sleeker new dashboard features a double-layer structure, giving the visual space between individual parts a ‘floating appearance’ that enhances the perception of a light, open cabin. The new air vents on either side coordinate with the clean look of the panel. The new Corolla also features Toyota Touch multimedia platform, which comes with a larger 7” screen and a 4.2” colour TFT information screen within the dash display. Featuring capacitive buttons to make the unit appear larger, it lends an innovative ‘high-tech’ look at the front. Toyota safety sense (standard in Luna and Sol grades ) is just one of many prominent technologies, which includes a pre-collision system with pedestrian recognition, lane departure alert and road sign assist. This is in addition to other safety features such as hill assist control, downhill assist control, trailer stability control and active traction control, ensuring that new Corolla offers best-in-class safety to match its iconic status. The Japanese carmaker also says the Corolla offers best-in-class cabin space as well as ample luggage capacity in the boot. The Corolla is available in three grades, the entry level Terra, which includes cruise control, air con, Bluetooth and 16” steel wheels. The other two grades are the Luna and the Sol.